"The way he began by delicately swiping the big gong with a drumstick, without even making the slightest attempt to strike the beautiful Chinese instrument, was fascinating from the first second. Moreover, the various sounds he elicited from this instrument. One voice after another could be heard; voices like those of humans. Delicate and tranquil breathing, followed by feverish, lamenting, and agitated emotions – as if by magic, they seemed to have been freed from a metal enclosure second by second with the help of Ingmar. 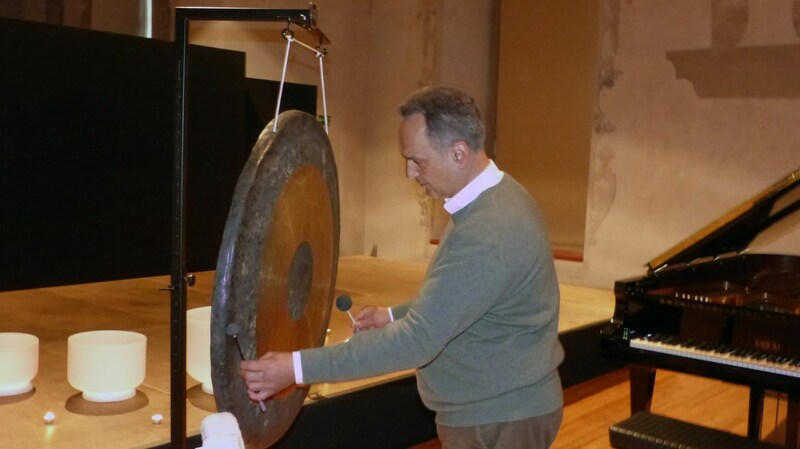 As the deep and powerful sounds of the gigantic gong – 95 centimeters in diameter – echoed through the hall, the ears of the audience were taken unawares. A mastering, masculine energy floated through the room; however it did not feel at all threatening. Highly concentrated, attentive and spellbound was his audience that you could hear a pin drop. It was neither the skillfully mastered rhythm nor the melody which flowed through the hall. It was pure energy, which swept the bodies of the listeners away and placed them in a state that is rarely achieved in concerts." It always has been my ambition and deepest desire to explore the nature of sound and its inner life as origin and source of all creation. I was taught the fundamentals of the nature of sound early on in my piano lessons. Since the age of 16, I have continued to enhance my skills whilst studying for and exercising my profession as a piano-maker. Later on, these qualifications allowed me to work with top musicians from all over the world. Thanks to my deep love of life, I was able to immerse myself into the mysteries of existence and my inner Self. From courses led by E. Haich and S. Yesudian 30 years ago in Zürich, in the nineties by the healer and mystic Dr. Stylianos Attheshlis (Daskalos) in Cyprus and, ever since 2002 through Grandmaster Zhi Chang Li in Munich, I have obtained tools that empower me to assist my fellow human beings in their pursuit of happiness and wellbeing. It is my experience of more than 20 years of hearing and listening to my “inner voice”, which I can express in manifold ways in music. My concerts and meditations with the sounds of my instruments, featuring the monochord, crystal singing bowls, the gong and the piano, will truly get under your skin. They will bring illumination and harmony back to your whole body, which then has room again for your Self, your Being, the light and everything that we are. One of the central pillars of our wellbeing and health is the conscious presence of our Self at all levels of our body. My concerts provide an opportunity for you to achieve such awareness within your own Self.